Life in its Ordinary Form: Back to the Grind. Fall semester has officially begun. and as much as I've dreaded it... there's something about getting a syllabus and notebook in order that makes the chaos in life seem a little more organized. 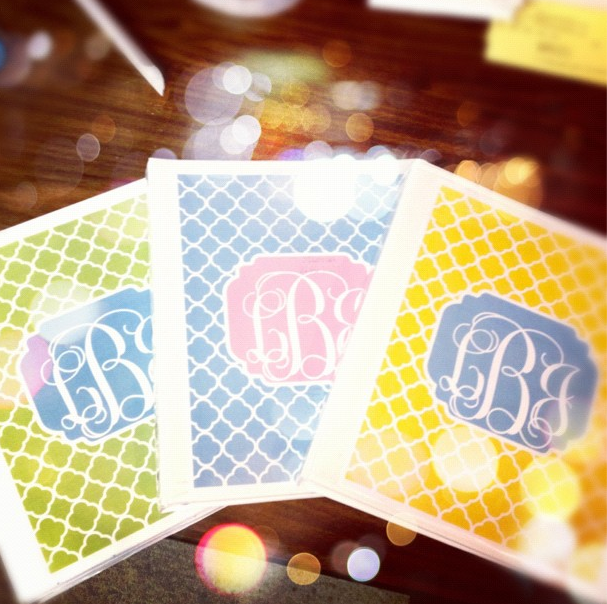 I made these monograms for my binders today, so in love. Go to www.forchicsake.com and make your own! Getting back in that routine, and having structure to the days again. It's kinda nice. and talks of football games are in the air. Yeah, how can you not love the coming of Fall? This semester I have some classes that I'm really looking forward to: Nutrition through the Life Cycle, Anatomy and Physiology, Micronutrients in the Body, and Cultural Foods Impact on Nutrition. I'm SO happy to be getting into the classes that really seem to be related to what I want to do. I'm also pretty excited because every weekend from now through November I've got stuff going on. Which is kind of crazy busy... but it's making me look forward to everything this semester. And what better way to kick it off than with a trip to Savannah with Sarah?! It's going to be such a fun Girl's Weekend, and while we're there we're going to get to meet up with Sonja :) Can't wait. Do y'all have any exciting weekend plans?! I loved the start of a new school year. It feels weird that I'm not joining! And good luck with good 'ol A&P. ;) Take lots of pics!!! So stealing your binder idea- those are ADORABLE. can't wait to see your pictures! I love Savannah! I love the start of a semester writing everything in a planner and those monogram covers are adorable. I guess I will settle for work schedules in my planner and nothing to do on the weekends but work. HAVE FUN IN SAVANNAH! How is it already time for school to start back up again?! I can't believe how quickly summer flew by. At least those pretty new binders help ease the transition. There really is something wonderful about fresh office supplies, haha :). Lucky gal, I wanna go to Savannah SOOOO bad!!!! I LOVE those binders, seriously, so cute!! Have a wonderful time in Savannah!